Delightfully hip and funky drum library in 96kHz. Hey, this is Drum Tree’s engineer and producer Ichiro. I have compiled some tips and advice on this page, which can be used in accompaniment to the instructions, to help you get the most out of your Drum Tree experience. 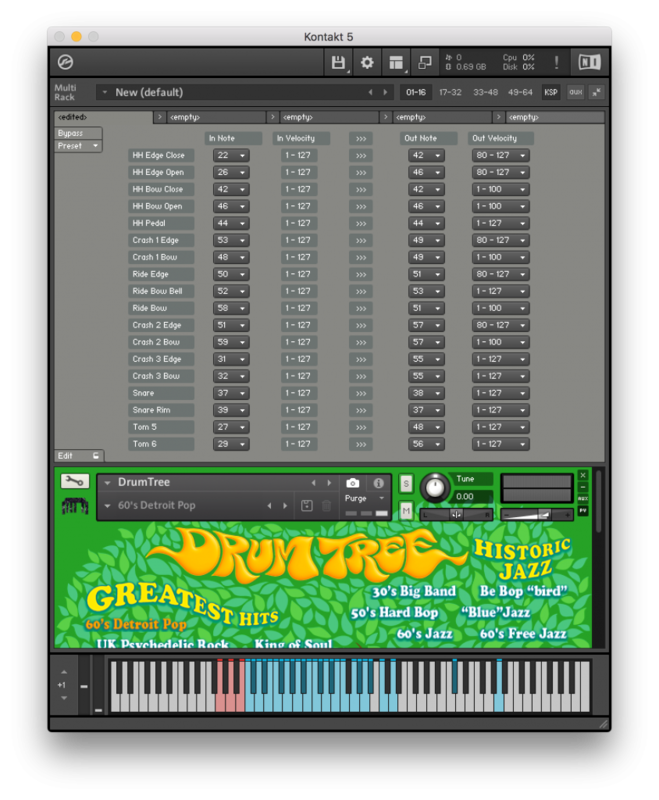 When you first install and open Drum Tree, you might notice that Drum Tree has a gentle level, especially in comparison to other drum libraries on the market. However, there is of course a reason for this. Usually, for the purpose of making a good first impression, other drum libraries’ sounds will generally be very loud, even if they have been clipped. However, when you actually use them in a track, you will inescapably end up having to clip them in master fader. Essentially, it’s better to achieve a balance where the volume of the drums and other instruments are lowered so as not to clip the master track without brick wall limiter. To avoid wasting time lowering the fader each time you insert drums, Drum Tree gives you a level that is easy to mix with from the offset, instead of first impressions. Therefore, if you swap Drum Tree with other products, you will notice that it is lower at the same fader level. The right way to accurately compare it is to adjust the peak level of the drum track. Please avoid hitting the highest velocity of 127 too frequently. Many mini keyboards usually tend to be stronger. Playing all notes at over 120 is not the intended sound Drum Tree’s production team designed it for. Normally around 100 is desirable, and sometimes it’s over 120 at the peak of a song to achieve real accuracy. Drum Tree’s 127 velocity was made with the strongest hits from pro drummers, a strength not usually used. The simplest way is to raise your speaker volume to a satisfactory level before opening DAW. Mostly your speakers are adjusted for CD’s or iTunes, but these songs are already mastered. Usually there is around 6dB difference in level between before and after mastering. Therefore, people mistakenly increase the fader and velocity to match that level. It is a pitfall that is surprisingly easy to fall into. This may not be relevant to all, but seeing as I like mini keyboards, I have tried out several and the ones that pleased me and worked best regarding velocity not rising too high were the KORG Nano Key Series and the ARTURIA KEYSTEP. In particular, Keystep really gave me stable velocity. Also, it’s good for Drum Tree’s key switch access because it starts with F, and has after touch control which mini keys normally do not have. All of these factors led me to using it in our demo at the NAMM show. For those in the habit of always using a plugin to boost the low-end of kick, please forget this with Drum Tree. Unless you have some particular intention in mind, you are better off not adding anything to it, as the kick Drum Tree provides is perfectly suited to each genre and already provides very powerful low-end. Depending on your speaker layout and the acoustics of the room, if you experience a kind of boomy sound, do not low-cut aggressively. It’s better to cut a little with thin Q at the exact point you really want to shave down. Incidentally, the kick from several of the rock genres have been carefully treated with analog EQ, for which I used modified MASELEC MEA-2. It is a Mastering EQ that does not create an unpalatable boomy sound, but provides tight bass.In general, there is no need for EQ or Comp with the kick Drum Tree provides. However, for example, the reference song of the Grunge Rock kit, “Smells Like Teen Spirit”, the first kick of each bar during the hook is emphasized at 4~5 kHz for the groves. Sometimes we also make the slight difference between hook and verse in rock or pop. The default sounds of Drum Tree’s kick are suitable for the verse. So when many tracks sound crowded coming out from the hook, and it masks bass drum, it’s perfect if you slightly add 4~5 kHz in rock genres.Conversely, if you feel your low-end is insufficient, rather than raising the low, you should raise the level of the entire Kick to the point you feel has sufficient low. If you only increase the low frequency, it will have an unexpected effect that ruins the balance and will cause further problems down the line. I know there are people who give a lot of importance to smoothing out the unevenness of minor frequencies. Up until around the 80’s, keeping everything very tight, organized was the mainstream approach. But nowadays this uneven undulating of sound is tending to be used in a positive way to promote dynamic expression in music. You could say that this unexpected musical event is quite a tasty characteristic of modern-day mixing and the PREMIER series are intentionally designed with this in mind. The kind of mixing that is dynamic, strong and not affected by minor variations is ideal. For those who believe in adding high-end to snares to make their songs brighter, once again please disregard this method. I don’t think there is any part of drum tree that is lacking in high frequency, because I made very tight and high speed attack with multiple analog compressors to suit most modern genres. A rich deepness and high resolution was achieved with an SSL G Compressor, then with Manley Stereo Variable Mu the sound was refined to be silkier. The attack was made with the sharp snap of Tube Tech SMC 2BM. This pattern was common for making modern genres of Drum Tree. It was also run through Rupert Neve Designs 5095 Summing Mixer, which helped with lowering the center of gravity. I used Lavry Engineering AD122-96 MX and Lavry Quintessence DA-N5 as AD/DA. All gears are special modified for fantastic sounds in my PREMIER mastering studio. Drum Tree is recorded at 96kHz, so Kontakt’s automatic converter will always work in the background during any other sampling rate sessions. This makes it sound worse than you could imagine and causes it to lose energy. Even if you don’t notice a problem during mixing, the difference will come up later during mastering. So, 96kHz is always recommended. Nowadays even notebook computers can work in 96kHz sessions easily. Perhaps pitfalls is a strong word, but I will explain some of the regularly occurring problems people have with their music when they ask me to master it. Quite often the beat is unclear because the bass guitar is overwhelmingly deep which masks the kick and seemingly nothing can be done to fix this during mastering. Perhaps this is just my personal opinion and there might be those who disagree, but I think the important thing is that the low-end of bass guitar does not pass out the low of the kicks. It is better to leave the very low tone to the kick and not set bass any lower than that. Generally, it is better not to have bass at a higher level than kick. There is a reason for this, the momentary low end of the kick is no problem even if you have very strong low frequency, however a continuation of overabundance of low can cause discomfort and create problems down the line. You also must be careful in some rock genres where there is a constant barrage of kick. I think this problem can be noticed easily if you have a subwoofer, but it can be difficult to judge if relying only on small monitors. If you use Drum Tree along with Bass Premier 96k, both will be perfectly balanced without the need for any EQ.When you need a very powerful synthesized bass etc., make sure to use Sidechain compression to be sure of not losing the kick in bass guitar. For those wondering how to use Sidechain compression, there are plenty of YouTube videos which explain it, and it is well worth learning as it will change your mixing. Due to the same reasons, I always aim to not have the hi-hat exceed that of the cymbals in high-end frequency. Seeing as the hi-hat is constantly sounding, cymbals need to jump out and widen your sound at the accent of the song.In genres that do not have cymbals, it’s ok to make hi-hat brighter, but I think Drum Tree’s hi-hat does not need any post processing. We are planning to optimize Drum Tree to Native Instruments NKS, Maschine series. Furthermore, we have been receiving some requests from people saying they need Loops. The core sound of Drum Tree has been completed. As of now I am formulating some ideas for a loop tool for Drum Tree. Before that however, work will begin immediately on the much-delayed Koto and Taiko Japanese instruments projects.Engineer IchiroPREMIER Engineering Inc. I got many comments from people who read this tips, even very professionals. Thank you all very much! Regarding the relatively small number of Japanese developers, perhaps I should convey my intentions in relation to the production side more directly, so I think I will keep updating and write a little more next time. Also, I have received word from many of Drum Tree’s users. Thank you very much! I intend to reply to you all one by one in the coming days. I am also thinking of introducing a comments section to this website. Drum Tree operates in an analogue style, where judgement is made based on the sound rather than numerical values. Therefore, there are no numerical value displays. But seeing as people have had a little trouble when they try to return the knobs to initial values, I will explain a shortcut.Holding the “Ctrl” key on Windows or the “Cmd” key on Mac while clicking the knob will reset it to zero. Also, if you right click a knob, it will give you access to Kontakt’s MIDI Learn Mode. From here you can assign any MIDI controllers you have at hand. For more details and verification please check Kontakt’s manual or YouTube. Mixer settings and different drum kit combinations can be saved. Choose the name of the genre you want to save and press Save. Saved files can be found, ordered numerically, in Drum Tree’s “Settings” folder. Using the Play button will playback the demo MIDI files which can be found in the “Patterns” folder. It is also possible to replace these with your own patterns.For Kit numbers please refer to this link. In order to overwrite these saved files, and for when you want to return to the original settings, I would recommend backing them up. Drum Tree fundamentally is based on a GM standard order, however there also some unique key arrangements. Usually velocity controls the strength of the sound, but in the case of F#1 closed Hi-hat, rather than strength of sound it changes the openness of the hat. I designed it to be like this to allow for a wide range of openness levels, however this means that if you want a completely closed hat you must hit the keyboard very lightly. I have been receiving requests to make it easier to hit these sounds.I am trying to decide how to accommodate both needs. Perhaps F#1 could be a switch that provides a completely closed hi-hat, or that puts the whole velocity map to the strong side. If anyone has any good ideas, please let me know. I have just received an excellent solution to the dilemma from AIKE, Drum Tree’s script programmer.Using Kontakt’s multi-script capability, we were able to implement this change without revising the Drum Tree program. It is a script that prevents the velocity of the Hi-hat (F#1 only) from going above a decided point, and prevents half open sounds. On Mac/Users/（Username）/Documents/Native Instruments/Kontakt 5/Presets/Multiscripts/Insert the decompressed zip file CloseHihat.nkp into this folder. The attached photo shows the steps to follow to achieve keeping closed Hi-hat. As the MaxVelocity knob is displayed, once the velocity is set at the max value of 100 the half open sound will not come out. The value of MaxVelocity will be stored under projects in your DAW. The above was a control knob for closed Hi-hat only, however we have prepared a further script for controlling open Hi-hat as well. This has two knobs. The closed Hi-hat mentioned above is included, so if you just download this file you will get both.By the way, it is not that we are limiting the velocity over a fixed point, this script compresses the whole velocity of F#1 and A#1. When Drum tree is used with multi out, the ambient becomes unavailable. To give a similar quality and feel to that of Drum Tree, I will publish two versions of Drum Tree’s Impulse Responses for your convolution reverb. Please install and use it in your sampling reverb from the marketplace. Please confirm the installation of Impulse response in their manuals. You can save multiple presets with snap shots. Just click camera icon and save your preset. 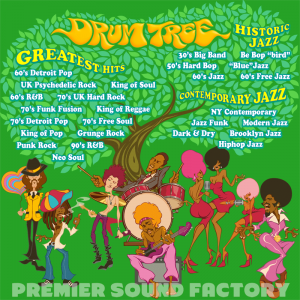 And if your Drum Tree always open 60’s Detroit Pop, Please update Drum Tree latest version. Download this .nki file, and swap your nki in instruments folder. We made multi-script for optimization to V-drum. We don’t have V-drums and could not test but you can arrange the midi number with this script. It’s a bit complex, but you don’t have to edit details. All you need is setting input midi number from V-drums. For example, F#1 close HH has gradation, like close to half open. So I sprit Drum Tree velocity to adapt edge and bow hitting of V-drums. Copyright © 2017 PREMIER Engineering Inc.